A (Amboor) Company has recently been sharpening its skills as 2RGR’s Air Assault Company with a series of aviation courses, culminating in Ex FALAMKO KOT on the Ulu Tutong training area. Report by Corporal Anil Rai, A Company, 2 RGR. All members of A Coy conducted a week of challenging abseiling training held in Training Team Brunei’s facilities. After several dry runs and practice from a static gantry, we put our new skill into practice with the Bell 212s of 7Flt AAC, abseiling from up to 150ft. After this training, we were confident that we could abseil effectively onto any terrain, be it open fields or the middle of a jungle LP. The following week, A Coy brought together our training with a 5-day exercise. The exercise began with a series of platoon serials (tracking, caching and CTR) and culminated with a company jungle air mobile operation. The aim of the exercise was to practice, rehearse and finalise the aviation SOPs for our role as Aviation Coy, prior to the unit move back to UK. Our training area for this exercise was Ulu Tutong, much deeper into the Brunei jungle than our usual training area around Labi, and therefore much more difficult to resupply. All our battle preparations were completed and double checked before we set out by coach to rendezvous with the helicopters. From the PUP we were ferried to our respective platoon landing points (LP) by two Bell 212s. Each platoon secured their LP by abseiling their first groups in. From the LPs each platoon began their respective patrol missions. Under the canopy, and carrying full kit, the tropical heat made it a really tough, gruelling task, both physically and mentally. The navigation in Brunei is always challenging as the features on the map are often different to the ground. Despite the heat, load and gradient we managed to reach our planned harbour location before last light. The following day each platoon began force-on-force missions, tracking and pursuing each other within our given area of operations. We all got to refine our basic patrolling skills and use our tactics against each other to locate and attack or ambush each other. Surprisingly, with a combination of tracking and cross-graining, this was the toughest part of the exercise for many of us. On the third day, and running low on rations and ammunition, each platoon was given the grid reference of a separate cache (planted several weeks previously) for resupply. Now our navigation had to be spot-on! Luckily each platoon managed to find their cache and distribute the resupply for the next phase of exercise. Each cache contained rations, water, ammunition and medical packs. Finding them gave us a real morale boost for the next phase of the exercise. If we had not found them, we would have had to switch into survival mode for the rest of the exercise! From the cache, we were given the company RV to meet up with the other platoons and the Coy HQ group. This was the start of our company operation. We conducted orders, final battle preparation and rehearsals prior to launching an initial advance to contact onto the LP at dawn the following morning. As planned and rehearsed, we cleared the surrounding ridgeline and were able to capture two and destroy the rest of the enemy in the area. Although the weather was against us, and our lift was delayed, we had planned to put in place a road block by helicopter. We arranged all the chalks and extracted from the jungle successfully as planned. At the LP we were met by the coaches for our return to the Coy lines. 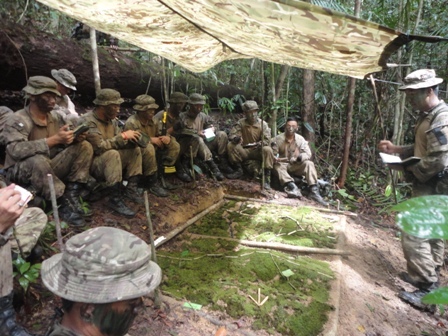 Ex FALAMKO KOT was very successful and useful, enabling all of us to practice and rehearse important air mobile drills, as well as our basic jungle skills. We now have the self-confidence should we be asked to deploy on aviation operations anywhere, at any time.